Reserve our Ukraine #2 kit to teach your students with cool items such as a traditional flower crown, soccer scarf, textbooks, photos, postcards, maps, currency and more. Items such as wooden eggs, dolls, trinket boxes, and other decorative objects display the beautiful painting and carving styles of Ukrainian folk art. Listen to samples of Ukrainian music and read informative books of facts and photography. Perfect for students in middle school and up! 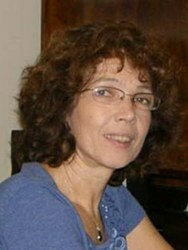 Maryna Kapustina is a Research Associate Professor in the Department of Cell Biology and Physiology, UNC School of Medicine. She earned her M.Sc. in Physics and PhD in Biophysics in Ukraine and came to work in UNC CH in 2003. Although North Carolina became her new home she keeps close ties with Ukraine, often travelling to Kiev to visit her friends and relatives. She is an active member of the Ukrainian Association of North Carolina. I am a Ukrainian homeschool mom with four children. Both of my paternal grandparents immigrated from Ukraine. I’ve been looking for something like your kits to help teach kids like my own and others in the homeschool co op locally here in Hickory. I lived in Ukraine in 1993 and 1994 and try to keep my culture alive in my family. I have four children 2 of which were adopted from Ukraine. Do you have any items that I could use to teach about Holodomor? Please see the Culture Kit FAQs and Tips page I mentioned in my previous comment, and then you can reserve the kits here https://navigators.unc.edu/kit-checkout/. Please email us at navigators@unc.edu with any further questions. Thank! Thank you for your message. I don’t believe there are any items in the Ukraine culture kits we have about Holodomor. You should be able to see an embedded PDF on each kit page that shows what items are in each kit. If you are interested in borrowing a kit you can see our Culture Kit FAQ and Tips page here-https://navigators.unc.edu/for-educators/resources/culture-kit-faq-tips/. The mission of Carolina Navigators is to provide UNC students with global opportunities on campus, and globally oriented engagement in the community, through our service-learning experience. In addition we aim to make quality resources easily available to K-14 educators to integrate global education into all areas of the curriculum, and to help prepare all North Carolina K-14 students to become informed and effective members of our global community.